What is fast charging? How does it work? How fast can it get? And why is a network of fast charging stations so important for the breakthrough of electric cars? Fastned Head of Network Technology Roland van der Put wrote an introduction to answer these questions. What is fast charging? And how is it different from ‘regular’ charging? All batteries — including those in electric vehicles — use Direct Current (DC) for charging and discharging. But the electric grid delivers Alternating Current (AC). Therefore AC from the grid needs to be converted to DC so it can be used to charge the battery. This is done by an AC/DC converter. This AC/DC converter is part of what we call a charger. Chargers can either be integrated into the vehicle as an onboard charger, or chargers can be external to the vehicle (for example a fast charger). Today, virtually all electric vehicles have a small onboard charger. You can use a cable to connect the onboard charger to a regular AC socket in your garage or plug it into a charge point. The charge point delivers the AC required for the onboard charger to charge your battery. So a charge point is not actually a charger but an intelligent socket to plug in your charge cable. If you want to charge faster, the AC/DC converter and hence the charger need to be bigger. But a bigger charger is heavier, takes up more space in the car and adds complexity and cost to the vehicle. On top of that any component in a vehicle needs to be automotive grade to ensure its reliable operation for the lifetime of the vehicle. So vehicle manufacturers usually choose a relatively small — and therefore slow — onboard charger to optimise between these factors. An external charger that does the AC/DC conversion can be a lot bigger, heavier, more complex and more expensive than an onboard charger. But it is also a lot faster. That is why they are usually referred to as ‘DC fast chargers’ or just ‘fast chargers’. A very common fast charger delivers 50 kW which charges a vehicle about 5 to 15 times faster than an onboard charger. The next generation of fast chargers was introduced in early 2018 and delivers 175 kW and can even be upgraded later to 350 kW. More on the impact of this later. A vehicle battery consists of many ‘cells’. A single cell is quite similar to a rechargeable battery you use at home, only bigger. A Tesla Model S with a 85 kWh battery pack contains 7,104 individual cells. A BMW i3 with a 21.6 kWh battery has just 96 cells, but its cells are larger than the cells used by Tesla. Together with all wiring and packaging the cells form the battery pack as depicted below. Today’s battery packs are designed with fast charging capability. For example the powertrain of the BMW i3 is rated at 125 kW peak power and 75 kW continuous power while fast charging is done at 50 kW. The battery pack of a car is never used 100%. The usable capacity of the 21.6 kWh i3 battery pack is around 19 kWh or about 90% of the total capacity. The difference of 2.6 kWh is used as a reserve to ‘cushion’ the impact of charging and discharging. The battery pack automatically cycles between around 5% and 95% of the battery pack. All of this is handled by the Battery Management System (BMS) and completely hidden from the driver. There are many factors influencing battery life including temperature, battery age, battery size, chemistry, duration of keeping a battery fully charged and number of charge — discharge cycles. Research shows that exclusive use of fast chargers hardly affects battery life when tested with the Nissan Leaf MY2012 which was one of the first full electric vehicles. And other research indicates that fast charging might actually be better for battery life. Battery technology will continue to involve which means that characteristics such as charge speed and battery life will keep improving as well. As a general rule, a battery will last longer when its size increases because fewer charge — discharge cycles are needed for the same mileage. During fast charging there is continuous communication between the BMS and the fast charger. The BMS instructs the fast charger to set the charge speed. This speed is usually expressed in kilowatt (kW). Charging a car for 1 hour at 50 kW puts 50 kWh of energy into the battery pack. On average, an electric vehicle uses 1 kWh to drive 5 km. Some vehicles like Tesla also express the charge speed in kilometers of range gained per hour charging. So 50 kW equals about 250 km/hour (‘250 km of range charged in 1 hour’). Power (expressed in Watts) is the product of voltage (Volts) and current (Amps). When charging at 50 kW this is typically done at 400V and 125A (400 * 125 = 50.000 W = 50 kW). Note that this means that the charge speed is influenced by both the voltage and the current. You can compare charging electricity with running water from a tap. Think of voltage (V) as the water pressure and current (A) as the size of the tap. If you increase the pressure more water will flow, and the same is true when increasing the size of the tap. The voltage is a characteristic of a battery. Most car battery packs today operate at around 400V when fully charged. But when a battery pack is not fully charged, the voltage will be lower - e.g. 325V. Voltage will gradually increase while charging, so this has a positive effect on the effective charge speed (see the blue line in the graph below showing a fast charge session of a 30 kWh Nissan Leaf). The current can be increased or decreased by the fast charger based on the instructions received from the BMS (see yellow line in the graph below). Most 50 kW fast chargers can provide a maximum current of 125A, but our 175 kW CCS chargers can provide up to 375A. Battery pack capacity. In general, a larger battery pack can be charged faster. So a Tesla Model S with a large 100 kWh battery can be charged at higher power than a BMW i3 with a 21 kWh battery. This is also the main reason why the current crop of plug-in hybrid electric vehicles (PHEVs) cannot fast charge: their battery packs are simply too small. Most PHEV manufacturers do not include the additional hardware (e.g. extra inlet and wiring) in the car. State of Charge (SoC). When the battery is almost fully charged the charge speed drops to prevent the battery cells from overheating. Typically at 80–90% SoC the speed drops and charging will slow down further closer to 100% SoC. That is the reason why fast charging is most effective between 0% and 80–90% SoC. Battery temperature. Battery cells operate most effectively between 20–25 degrees Celcius (68–77 degrees Fahrenheit). When battery temperature is too low or too high, the BMS reduces the requested current to protect the health of the battery cells. If the battery pack is equipped with a heating or cooling system (e.g. the BMW i3) the BMS will activate this system in order to control the cell temperature. Note that battery temperature is not only influenced by the outside temperature, but also by (highway) driving and (fast) charging as this will generally increase battery temperature. Battery chemistry. When designing a battery manufacturers have to make choices on size, weight, costs, life and performance of a battery. Depending on the target audience of the vehicle they could compromise battery performance over costs and weight for instance. Alternatively a higher-end vehicle will have better performance and may include battery temperature regulation, but it will also come with a higher price tag. 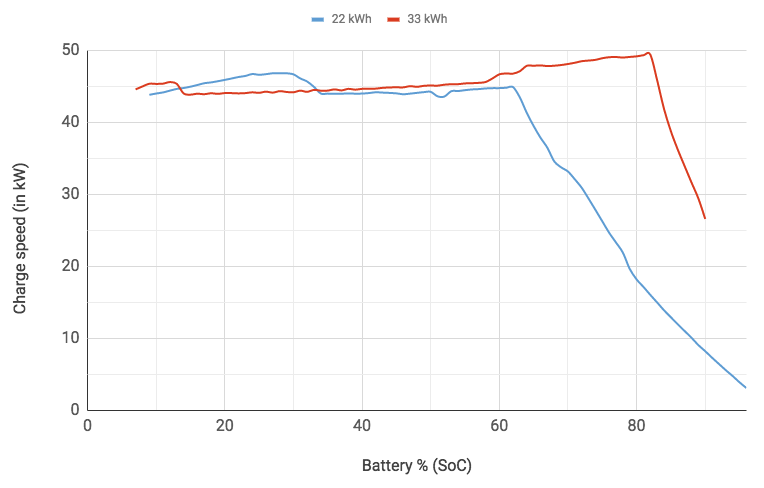 The graph above shows the charge curves of 2 generations of BMW i3 batteries (22 kWh and 33 kWh). The charge curve is different for each vehicle make and model. Charge curves for most popular vehicles can be found on our website. Fast chargers themselves could limit the maximum speed at which a vehicle can be charged. If a fast charger is rated at 50 kW it will never provide more power even though the vehicle might be able to charge faster. Also the there might be limitations of the grid connection or multiple chargers on a single location could share power which may result in a situation that a fast charger cannot provide full power. For example at a Tesla supercharger two stalls typically share their capacity. So if one car charges at full power, there is limited power left for the other car. At Fastned all chargers can typically work at full power regardless of the number of vehicles charging at the same location. Currently there are just two open fast charging standards: “CCS” and “CHAdeMO”. Combined Charging System (CCS) was developed by seven car makers and was originally designed for charging up to ~80 kW (at 400V). The standard is promoted by CharIN and is backed by a large number of car makers and charger manufacturers across the world. CHAdeMO was already developed in 2010 by the CHAdeMO Association and is an initiative of Japanese car makers. The initial design allowed for charging at up to ~50 kW (at 400V). Fastned is a member of both organisations and we offer these standards at all of our stations. Please note that Tesla has a proprietary charging protocol for their Superchargers, which can fast charge up to 130 kW. Because the Tesla protocol is proprietary and therefore not open, fast charger manufacturers cannot include Tesla plugs in their chargers. To get around this problem, Fastned installed Tesla CHAdeMO adapters at all of its stations in The Netherlands. Most fast chargers installed until late 2017 can deliver up to 50 kW and virtually all electric vehicles are limited to 50 kW as well. At the time of writing the only exception - apart from Tesla - is the Hyundai Ioniq which can charge up to 70 kW. However, if a Hyundai Ioniq charges at a 50 kW fast charger the charge speed is of course capped at 50 kW. German car manufacturers such as Volkswagen, Audi and Porsche seem to agree that ultra fast charging is critical for the adoption of electric cars. In 2017 CharIN released the specifications of an enhanced CCS standard that allows charging up to 350 kW. That’s up to seven times faster than a 50 kW charger reducing the time to charge 250 kilometers of range from one hour to less than 10 minutes! At the Frankfurt Auto Show of 2015, Audi revealed the Q6 e-tron quattro concept. This full electric Audi is able to charge at 150 kW and will go into production late 2018. At the same show, Porsche presented their Mission-E which is scheduled for 2019 and supports charging at 300+ kW. Both cars feature a large battery of at least 90 kWh and a real world range of 500 km. Meanwhile many car manufacturers announced electric vehicles that will come to the market in 2018-2020 which can take advantage of these high power chargers. The Jaguar I-Pace will be among the first ones to be available at the end of 2018 that supports charging at 100+ kW. These announcements show that the race for faster charging is on. It’s also clear by now that a network of ultra fast charging stations is required to support the introduction of these next generation electric vehicles. Meanwhile the Japanese car makers are also working on faster charging speeds. The CHAdeMO Association made available the specifications for charging up to 200 kW but - at least in Europe - no vehicles have been announced that support CHAdeMO charging at more than 50 kW. It remains to be seen how CHAdeMO will develop in Europe since the CCS standard is increasing its market share very quickly. Many Fastned stations are already prepared for 175 kW chargers. Fastned has grid connections that support charging 4-8 cars simultaneously at up to 175 kW. Other Fastned stations can easily be upgraded with a larger grid connection as well. More capacity can be added in the future by introducing on-site battery buffering and/or by further increasing the capacity of the grid connections. The layout of our stations is already designed for maximum throughput of cars. We installed our first 175 kW chargers in February 2018 and will continue the deployment of 175 kW chargers in the years to come. These chargers are fully prepared for 350 kW charging as well once the vehicles arrive that are capable of this high charge speed. The Hyundai Ioniq can already benefit from our 175 kW chargers by charging at up to 70 kW which is 50% faster than on a 50 kW charger. This reduces the charge time from 30 minutes to around 20 minutes. We have found that for instance taxi drivers love this reduction in charge time since it enables them to take more rides per day and simply earn more money. Fast charging stations will be key to charging large numbers of electric vehicles. Charging an electric car will be a mix of home charging, destination charging (at work, a supermarket, hotels, etc. ), public slow charging and public fast charging. As we move towards a larger share of pure EVs on the road, its increasingly important to think about the “total cost of infrastructure” to charge these cars, including the cost of grid connections, grid upgrades and land use. Economies of scale can dramatically lower the cost to operate a network of fast charging stations and thus lower prices for consumers. Besides economies of scale, there are other distinct advantages of clustering fast chargers on a single site. Fast charging stations with multiple chargers and a canopy can provide great brand visibility and thus drive growth at high-traffic locations. Stations with a roof also provide cover (and can generate electricity through solar panels) and make it easier to provide additional services in the future. Fast charging stations are mostly used between 07:00 and 23:00 — 16 hours of use per day. A maximum of 50% utilisation during the hours of use (half of the chargers are in use during these 16 hours). On average an EV charges at 70% of the maximum that a fast charger can provide (not all EVs will be able to charge at full speed for the entire charge session). An existing station has a capacity of 204.000 kWh annually and an upgraded station more than 1.4 million kWh. A next generation station thus provides 7X more capacity on the same land area, and 14X more capacity with 8 chargers. That’s an order of magnitude improvement. The capacity of a station 2.0 is seven to fourteen times that of a current fast charging station. However, the one-off costs (CAPEX) such as permits, grid connection, equipment, construction, installation and project management of a station equipped with four 175 kW chargers are far below that of constructing six to thirteen additional stations. Recurring costs (OPEX) such as technical maintenance and cleaning are only slightly higher for the 2.0 station. Capacity thus rises (much) faster than costs do. Therefore the cost per kWh delivered decrease (as long as a station has a certain number of customers per day). Another advantage lies in maximizing the use of a single grid connection. In many countries electricity prices are heavily taxed. Many of these taxes are regressive: the more you consume per grid connection, the less taxes you pay per kWh. Can the grid handle this? As long as fast charging stations are connected to medium voltage rings (10kV or 20kV), station power can be scaled up in line with the expected exponential take-off of electric vehicles. Supermarkets, high rise office buildings and large warehouses are routinely connected to the medium voltage grid with connections of 1 or 2 MW. Fast charging stations are comparable in power draw and are well within the limits of the capacity of the medium voltage grid. The other fundamental advantage of large fast charging stations is reduced waiting time. If we assume an average of 30 minutes to charge a vehicle, an occupied stall on average results in 15 minutes of waiting time for the next EV driver. With two chargers this is reduced to 7,5 minutes and with 4 chargers to less than 4 minutes. So a station equipped with multiple fast chargers greatly reduces waiting times. More chargers also improve redundancy of the station. EV drivers must be able to depend on fast charging stations. Even when a single fast charger has an uptime of 99%, then the charger is still unavailable for 3.6 days per year. For a station equipped with two fast chargers with both 99% uptime, the time that both chargers are unavailable at the same time is reduced to less than 1 hour per year since both fast chargers operate independently of each other. You can follow @fastned for the latest news and me @rolandvanderput.